Welcome to the East-side of Hawaii. Kai Honu Hale or Ocean Turtle House is a 3-level oceanfront custom home in Hawaiian Beaches that was designed to make you feel as though you are floating on the water... that's how close it is to the gorgeous Pacific Ocean. Year round, from every room in this 3 bedroom 2 bath house you will get a 180-degree unobstructed views of magnificent sunrises with dolphins, turtles, and other marine life. During winter months, you will also see up close, whales passing right in front!!! What a way to enjoy your Hawaii vacation... the sound of the waves, whales singing, and ocean breezes. Another great bonus is that the house is located near the most eastern tip of the Big Island and is therefore almost always free of VOG(volcanic haze) which affects the air quality in Kona(west side) and Ka'u(soutern side)of the island. Prevailing tradewinds and seabreezes keep this haze away from our location. This house is located in an ideal neighborhood for taking walks, jogs, or bike rides. Or if you feel like relaxing, stretch out on our lounge chairs outside where you can enjoy the sun and ocean views. It is located just 7 minutes from Pahoa town which has many restaurants to choose from (Mexican, Thai, Italian, etc...) We don't have a beach right in front but we are near to Pohoiki beach park (swimming/surf spot), the Wai Opae fish sanctuary which is great for snorkeling, and the geothermal hot ponds just down the road. Also, the Hawaii Volcano National Park is just 45 minutes away. The newest lava flow is 5 minutes away now. Every room is decorated with Hawaiian-style furniture. The master bedroom on the third floor has a 'boat-like' feel. When you lay on the bed, it feels as though you are on the water! Because of the layout of the house, each additional room also has ocean views, so no guest gets left out. The living room has 3 huge panoramic windows, letting the blue ocean permeate throughout the room where everyday you can see honus(turtles) dancing in the waves. This vacation rental has all the necessities of home, including a 37' flat screened TV, and free Wi-fi internet access. Also available for use is a charcoal BBQ but you have to bring your own charcoals. If you need advice on any spot in the Big Island, we are here for answers. We can give you informative advise being that we are from the Big Island and live here too. We are located 30-35 minutes from the Hilo airport. Check-in is from 3:00PM or after. Check-out is at 10:00AM, unless other arrangements have been made. Upon confirmation, directions will be e-mailed to you. Mahalo from the East-side of the Big Island. Emails preferred. My husband and I are both born and raised in Hawaii. I came from Oahu and am proud to be of Hawaiian descent. My husband was born in Kona, but raised in Kalapana on the Big Island of Hawaii, before the lava came and took it away. He brought our family back to the Big Island 12 years ago where we have been ever since. The vacation rental is ours and my dad's house. My dad bought it in the hopes of moving to a peaceful, less crowded place than Oahu someday. We have been managing our family vacation rental since 2007. Our main goal is to make our malahini(tourist) love the Big Island as much as we do and we put every ounce of aloha in our rental(s) and in keeping our house(s) comfy and clean. If you are looking for cleaners for your own vacation rental, please consider us to help. We really enjoy taking care of vacation rentals. The way the house is designed, you have an ocean view from anywhere in the house making it unique compared to other vacation rentals. All of us enjoy it here on the east side of the Big Island because it feels as though you are in 'true' Hawaii, not the over developed parts of Oahu, Maui and the west or Kona side of the Big Island. It is definitely a place where you can enjoy nature at its finest. Plus it is a safe place to raise our three sons and to be able to teach them the ways of Hawaii life such as fishing, diving, surfing, and farming. The best thing about this house is seeing whales just offshore during the winter season. It is amazing to be able to sit and watch the ocean with all its marine life (turtles, fish, whales, opihi, etc...). FYI-if you are looking for turtles, you need to look under the water in the surf(polarized glasses help). They aren't sitting on the rocks in plain sight. Aloha a hui hou! 2 bathrooms. Master bathroom has walk-in shower. Main bathroom has a bathtub. View of Mauna Kea on a clear day. 180-degree of the ocean. House is approximately 50 ft. to ocean but it seems much closer. 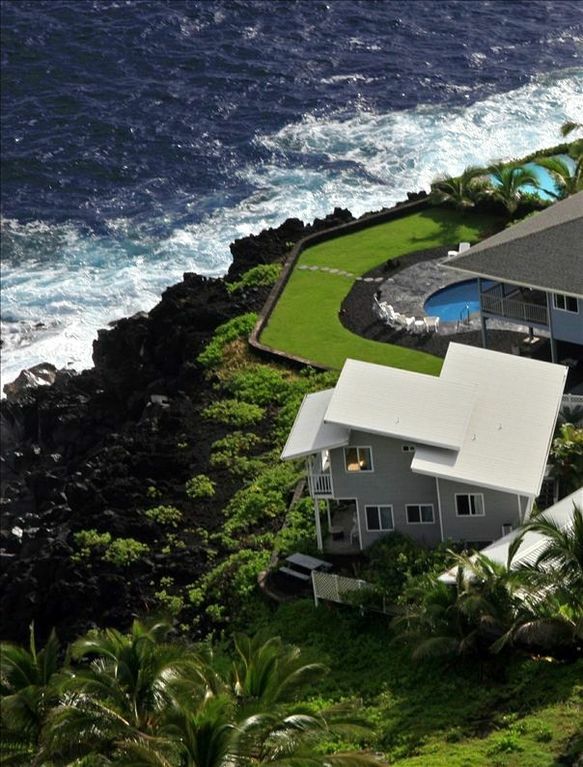 View the entire eastern coastline of Hawaii. 300 thread count, feather or non-feather pillows included. For private use, located in garage. 2 washes of laundry soap is provided. Bath and beach towels provided. Please be sure all towels are returned to the vacation rental. No coffee provided. Must bring your own along with cream and sugar. Coffee filters can be found in kitchen pantry along with a coffee grinder. fully-stocked kitchen blender, coffee maker, coffee grinder, toaster, and rice cooker. Located on 3rd level off of master bedroom. Communal pool found in Pahoa town. Reusable coolers and floats available for use located also in the garage. Please help yourself. Very nice place! Love the view from all rooms and back patio area. Perfect for my family’s 3 day stay on the wet side of the island. Lots of turtles swimming in the waves! Clean and exactly what was expected and advertised! Perfect vacation spot on the ocean, great price too! Kai Honu Hale was the perfect vacation spot for myself and family. The house had everything we needed and was super clean and the views were amazing! The neighborhood was super peaceful and sitting out by the ocean was spectacular. Kai Honu Hale is a great deal too especially for an oceanfront. I don’t think we would be able to have stayed anywhere on the ocean at the price we paid. Will definitely come back again. So close to the ocean that you feel the mist from the waves breaking on the rocks. Absolutely stunning view, beautiful home! This home was beautiful. The view from the back was absolutely stunning. It was so very easy to get to, get in, and had all the amenities you could need. You can sit on the back porch and watch whales go by (in season) and the nearby town of Pahoa has some great restaurants and shops. Close enough to Hilo, the Volcano National Park and other sites. We thoroughly enjoyed it and would love to stay here on our next visit to The Big Island. To-date we have stayed at 21 different VRBO vacation rentals in 12 countries, including 8 different places in Hawaii. Without a doubt, this unit is the worst vacation rental we have ever experienced, even with its beautiful location and view. This place is tired and worn and in desperate need of significant attention. While the sheets and towels were fine and some furnishings and decorations were nice enough, pretty much everything else is cringe worthy and made us feel very uncomfortable. The walls are so rough and worn, in desperate need of repairs and fresh paint. In addition, so many items just need outright replacement (coffee pot, plates, kitchenware, shower caulking, bathroom stool, shelf paper, closet door, light switches, washing machine to name but a few). And any repairs that have been done are shoddy and incomplete. I wish VRBO would let us post pictures because then you would be able to see what we mean, because its really quite terrible and disrespectful to the renter. I agree with others that Liv is responsive. In fact my pleasant e-mail communications with her made me hesitate to post this review but I came to the conclusion that, as I rely on VRBO reviews to make our vacation rental choices, I owed honesty to my fellow renters more than I owed anything to Liv who rented us the worst place we’ve ever stayed. In the end, we only stayed 2 of the 3 nights we booked, choosing to forfeit one night and stay at a nice clean hotel. I did not ask for a refund or contact Liv during our stay. In our minds, there was no point as the magnitude of the disappointment was nothing that she could correct in our 3 night stay. In fact, I’m not even sure 3 months would be enough time. I’m so sorry you feel that way about Kai Honu Hale. All my pictures in the house aren’t altered in any way to make it seem different from what is on my website. In fact, all the pictures are taken with my iPhone. Being that the house is directly on the water, it does get a lot of wear and tear and we are constantly fixing things on the house. All the room except the kitchen are newly painted and everything in the house is consistently being changed out with new items. I do understand where you are talking about about some spots being not caulked good. The new shower and master bathroom sink we paid a plumber big dollars to replace, and he didn’t do a very good job with it so I do agree on that. We keep the rental super clean and all fresh sheets and towels and everything gets cleaned every check out. The wooden floor is original to the house but since it’s a rental and we want to keep an oceanfront house affordable, we opted to not change it or we would have to increase the price of rent per night. Kai Honu Hale is a place for everyone to get the chance to enjoy staying at an oceanfront house that is super clean and the views are spectacular. I wish this guest might have brought this issue to me while staying instead of writing such a horrible review. It’s the first one I’ve had in years. I’d prefer guests coming to me so that I can fix the issues cause no issue is too hard for us to fix. Everyone should spend time on the Pahoa side of the island and this place is in pretty central location to see all the good stuff. NE side of the island of Hawaii (the Big Island) and to the SE of Hilo town about midway between the town and the east tip (Cape Kumakahi) of the island. The trade winds arrive here from the E to NE and keep the air clean and free of volcanic output (vog) that you'll see along the Kau (SE) and Kona (west) sides of the Big Island. There is nothing between you and California except for over 2500 miles of the Pacific Ocean. Enjoy the breeze, no air conditioning needed! Rates are subject to change unless you have been confirmed with a price. Children ages 5 and under are free of charge. If you have a child 5 and under, please let me know in the written area but do not add them as a guest for the total so you won't get charged for them. Check Payments- 50% due now with $100 refundable damage deposit, 50% due 30 days prior to check-in date. Cancellations must be made before 30 days to check-in date for a full refund unless there is a natural catastrophe. Rescheduling your dates is okay.